Titan Power provided ASU with an 800kW rental generator for back-up power during their 6-week, Fall 2011 registration period. 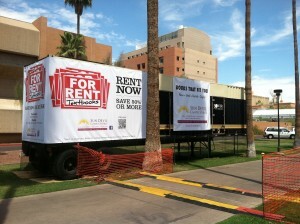 The generator is located alongside Palm Walk, which is a main drag through ASU campus. The Sun Devil Book Stores also took advantage of this opportunity to advertise their new textbook rental program. This back-up generator is required due to the influx of online traffic during class registration. Visit our album on Facebook for pictures of the rental generator on Palm Walk. This entry was posted in Back-up Power Industry, Customers, Facility Maintenance, Mission Critical Industry and tagged Arizona, Arizona Customers, Arizona State University, Backup Power, Crytical Systems, Emergency Power Systems, Generator, Mission Critical, Titan Power, Titan Power Inc. Bookmark the permalink.